Achieve sharp, clean paint lines and cut down your touch-up time on your next project with Duck Clean Release Multiple Surfaces Painter's Tape. Its strong adhesion makes it ideal for hard, durable surfaces like glass, wood and tile for clean lines. Plus, it protects against paint drips so your paint job stays clean and you stay stress-free. No matter what the project, this painter?s tape allows contractors and home DIYers alike to achieve sharp, clean paint lines even in direct sunlight. Perfect for a variety of surfaces, this painter?s tape features a strong adhesion while preventing paint bleed for professional results. I have used this to paint stripes on my living room walls and It worked perfect! i used my license to run down the sides of tape before I painted with 2 colors, after painting I pulled the tape off and it did not pull off the paint underneath it nor did it allow 2nd color to run beneath the tape! I am just starting a painting project in my hallway and will definitely be using this tape! I loved using this tape for my painting. It is easy to apply to my surface and easy to remove when I make a mistake (quite often, lol). In addition once I was done with the project and the paint had dried it removed easily without ripping any paint away from the wall. :) I highly recommend this product and it works amazingly if you know how to use it and follow directions. This product has been all over my house! I am a first time homeowner and have been completely remodeling my house and this tape has been so useful! Not only is it good to help trim around objects, and to assist in that perfect accent wall, but it is GREAT to help do stripes or any other types of line. We also used it on our refinished hardwood steps as we were painting the backboards on the steps. Don't just use masking tape! When I finally broke out of painting everything white, I learned a few hard lessons about applying color paints. Lesson one was that when one color meets another, it needs a good edge or it looks sloppy. For that, you need tape for masking, and you need to apply it carefully. The second lesson: tape sticks with adhesive. Use the wrong tape or leave it too long, and it will either leave adhesive behind when removed or take up the finish underneath. The third lesson: Projects go over; the tape will probably stay there for too long. Carefully applied, the painter's tape gives a good line. And the longer grace period before adhesive problems are liable to crop up is well worth the little extra cost over going with just basic masking tape from the drawer. 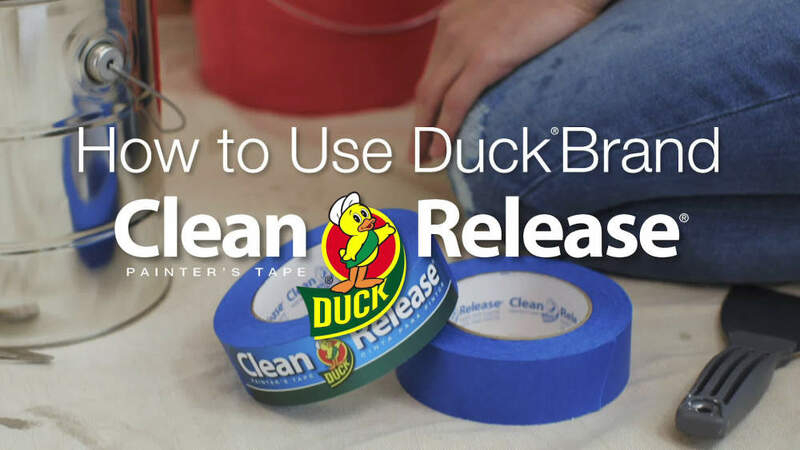 I chose Duck Tape brand "Clean Release" painters tape because I trusted in the brand, and expected only the best results. I was thoroughly disappointed, and angry when, after less than 40 minutes of adhesion to my bathroom walls (which had been painted with top of the line Behr Semi-Gloss paint) were destroyed upon removal of the tape. Now I have to buy new paint (hope it matches) and repaint those (2) walls. Hi Joe, We are so sorry to see you experienced paint tear. We would like to discuss this with your further to understand better why this may have happened. Please send an email to askus@shurtech.com with a reference number of 000947725A in the subject line. Thanks! Do NOT buy this! Better off using nothing. I had paint all over!! I applied this tape very meticulously, so nothing should've bled through, but now I'm going to have to repaint all my trim, and many spots along the ceiling. Ugh. I purchased the product to paint crown modeling in room. The tape allowed paint to bleed through. Not a single inch held a clean line when removed. I do NOT recommend using this tape for your painting projects. It set me back several days. I applied this tape and removed it as directed and it completely ruined my brand new paint job! I have to re-paint an entire wall because when I removed the tape, it took the paint that was connected from the piece of tape to the wall and completely peeled it off. It happened in 4 different places with 2 different brands of paint so I know it was the tape.So not only did I waste money on the tape, but now i have wasted money on paint. Not to mention there was definitely some major bleeding and adhesive left behind on the surface it was supposed to be protecting. I followed thew directions to the letter, but this product just didn't do anything for me but cost me more money.So this product was utterly useless and cost me so much more money. I would have been better off not using anything at all.